Giveaway is open to US and CAN residents only. Void where prohibited. One lucky winner will receive a free copy of this book. 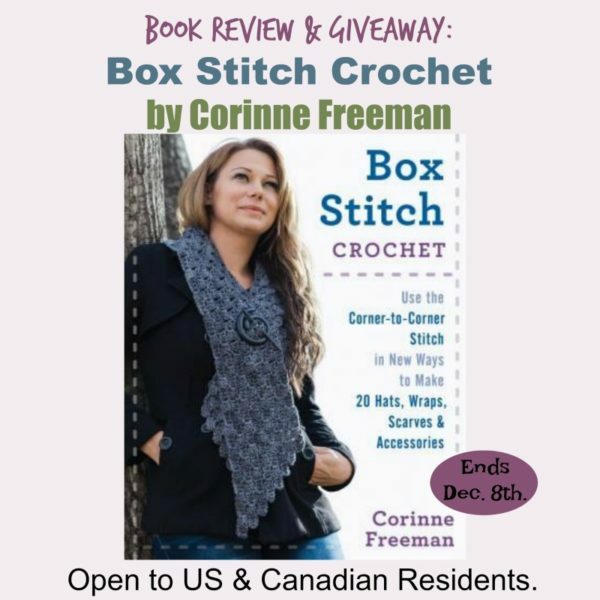 Box Stitch Crochet by Corinne Freeman takes the box stitch, also known as the corner-to-corner stitch, to a whole new level. In the book you’ll find many elegant clothing and accessory projects that you’ll be proud to wear everywhere you go. This shrug is perfect for the fall or even winter weather. It’s the perfect vest-like garment to go with anything and everything from jeans to dresses to give you an extra touch of warmth in the cooler weather. See how beautiful this is with a skirt? I’m picturing this in a white for a bride or bridesmaid. Or, in a black for a funeral or a fancy dinner party. I especially love what she did with the lace around the edge, it’s a great way to show off your crochet talent. I just love the tapered ends of this scarf. It’s really a beautiful design that you’ll be proud to wear and give as gifts, year after year. And you can wear it with a pin as shown, or wrap it around for a super cozy winter scarf. It’s like a super long scarf crocheted with two rows of diamond motifs. It’s totally genius, yet it looks simple enough for anyone to make. Instead of buttons, this camisole simply laces up at the front. Another brilliant idea. It’s pictured with a simple top and jeans, but the elegant design of this hat is a perfect match for anything you have in your closet. I love this dress; it’s a simple and mindless pattern, but perfect for all your summer events. Of all the patterns, I would have to say this is my absolute favorite! The unique way in which the motifs are joined is absolutely stunning. And you can wear it in a number of ways to add a touch of style and to keep warm. And now, here is your chance to get your copy. Giveaway is open to US and CAN residents only. Void where prohibited. One lucky winner will receive a free copy of this book. Giveaway Runs Through Dec. 8th.